In light of Toronto’s upcoming municipal election, the PPGR is dedicating this week to a special series of posts that focus on municipal policy issues. Be sure to check back tomorrow to read up on another topic of municipal interest. Two leading candidates for mayor in the upcoming Toronto municipal election, Olivia Chow and John Tory, have included in their policy platforms a promise to plant 3.8 million trees in Toronto over the next 10 years. The timing of their respective announcements for this surge in tree planting – April 22 for Mr. Tory and April 25 for Ms. Chow – came in the months following the decimation of Toronto’s tree canopy by the December 2013 ice storm. 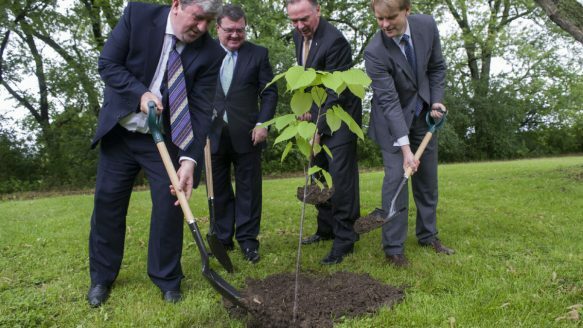 Chow and Tory’s promise may also have been influenced by the 2007 arrival of the invasive Emerald Ash Borer, which will kill most of Toronto’s 860,000 ash trees by 2017. Another impetus may have been current Mayor Rob Ford’s much publicized motion to eliminate $7 million from the 2014 operating budget for planting trees. Since replacing his brother in the race for mayor, Doug Ford has not added to the tree conversation, although he has publicly supported this motion. Whatever the candidates’ reasons, tree planting policy platforms now appear to be both economically and environmentally astute. An economic analysis of the city’s “urban forest”, recently released by Toronto Dominion (TD) Bank, valued Toronto’s 10 million trees at $7 billion and credited them with providing $81 million in annual services. So what municipal services do trees provide? One of the most obvious – particularly at high noon on Toronto’s Pride weekend – is climate moderation. Trees lower the energy demand in buildings (both for heating and cooling) by providing shade and shelter. They also reduce air pollution by absorbing chemical air pollutants and capturing particulate matter on leaf surfaces. And the benefits of reduced pollution for human health can be measured: in New York City, for example, the reduction in air pollution resulting from the city’s urban forest has been estimated to reduce human mortality by 8 lives per year. Wet-water flow (i.e. storm water surge) services are also of significant importance in Toronto, as highlighted by recent flooding in many neighbourhoods. In much of the city, old combined sewers mean that storm run-off ends up in the same underground pipe system as sewage — and if the volume of water is too high, these sewers overflow, spilling sewage (albeit diluted) onto city streets. This sewage eventually runs off into the lake. The reduction in storm water entering the sewers on account of Toronto’s trees has been estimated to be by far their greatest cost-saving service, at $54 million annually. In 2013, Toronto city council approved a Strategic Forest Management Plan that set a goal of increasing the city’s tree canopy cover to 40 per cent by 2022. That target date was moved to 2050 at a subsequent meeting. Before the damage caused by last year’s now infamous ice storm, Toronto’s canopy cover was estimated to be between 26 and 28 per cent. Yet trees are small when they are planted, and the 3.8 million little trees that Ms. Chow and Mr. Tory plan to plant will not have any significant impact on the overall size or benefit of the city’s tree canopy. The same goes for other services that trees provide – the bigger the trees, the bigger the benefits. While the aforementioned commitments made in the ongoing mayoral race are to be commended, Toronto is not only in need of stable funding for the planting of new trees, but requires also a political and financial commitment to the continued maintenance of the existing tree canopy. Sandy Smith, a professor in the Faculty of Forestry at the University of Toronto, has observed that for a better appreciation of the role of trees in the functioning of the city, they should be considered a major component of green infrastructure — and green infrastructure is just as important as grey. Other municipalities are starting to move beyond tree planting photo opportunities to incorporating trees into long-term infrastructure planning. For example, New York City included $735 million for green infrastructure in its 10 year capital budget in 2011, primarily for the purpose of dealing with storm water. The evidence suggests that Toronto’s vision of 40 per cent canopy cover, as outlined in the City’s Strategic Plan, is a smart investment for economic, environmental, and human health reasons. The upcoming change in leadership at City Hall provides an opportunity for the effective implementation of this vision. Tara Sackett is a 2016 Master of Public Policy candidate at the University of Toronto’s School of Public Policy and Governance. She previously obtained a PhD in Natural Resources Science from McGill University in 2007, and prior to attending SPPG worked as a researcher exploring how aspects of global change affect ecosystem processes. Her main areas of policy interests include climate, energy, and environmental policy.